The 2019 Hyundai Santa Fe is the fourth-generation compact crossover SUV which will compete against the like of the Nissan Rogue and the Honda CR-V. It boasts a newer style in a bigger package with multiple options for its powertrain compared to other vehicles in its category. This brand new Santa Fe model will replace the existing Santa Fe Sport. The current model is a bigger 3-row vehicle and will be known as the Santa Fe XL and is going to be replaced by next year with an even bigger SUV with a new name. The 2019 model will be introducing a diesel variant, which provides a 3-row option too. This 2.2-litre turbo diesel will have an estimated output of about 190 HP and 322 lb-ft of torque. This, however, is not going to be offered until the early 2019 calendar year. At release, the regular 2-row Santa Fe is going to provide buyers with a choice of the normal 185-horsepower 2.4-litre 4-cylinder engine which will make a turbocharged 2.0-litre at a 235 horsepower and 260 lb-ft torque rating. All of these models, however, will have a new 8-speed automatic transmission included. The brand new 2019 Hyundai Santa Fe will be riding on a new platform which has a wheelbase of about 108 inches – that is 2.6 inches bigger than the Santa Fe Sport. Its overall length is higher by 2.8 inches to 187.8 in total, and the vehicle is about half an inch wider at 74.4 inches. This new Santa Fe isn’t only a bit bigger, but it also looks like it got buffed as it sports the more traditional SUV look compared to the sleeker roofline of the Hyundai Santa Fe 2018. The new Hyundai will have a new cascading theme for its grille which comes with a front fascia that is topped by a chrome bar and mesh texture. Its fog lamps and headlamps are located at both sides of the primary inlet. It will have a more muscular profile similar to an off-roader with wheel arches that are well-defined and lower sills. Its greenhouse will be more upright, and it will feature a bigger daylight opening with a satin chrome texture, while its optional roof railing will add to the rugged look of an SUV. The regular models will come equipped with 17-inch tires and wheels, while the diesel and turbo models will have 19-inch alloys. This new Hyundai will also have a new cabin which has a dual cockpit layout which uses high-quality materials to give it a posh appearance. Its centre dashboard of standard models will feature a 7-inch infotainment touchscreen that is free-standing while the 8-inch units are equipped on the higher trim models. Just below its centre vents are the manual controls to operate the HVAC and the switches to control the heated/cooled seats together with the heater for the steering wheel. Its centre console will have a traditional gearshift lever together with a couple of cupholders and switches for the drive modes and electric parking brake. It will also have a defeat button for the start/stop system of the engine. The driver’s instrument cluster located in front of them will have a big centre speedometer together with a tach and gauges for the fuel and temperature. An available option would be a full-colour 8.5-inch heads-up display which will show the smart cruise control settings, speed, blind spot, nav directions and assist warnings for forward-collision. 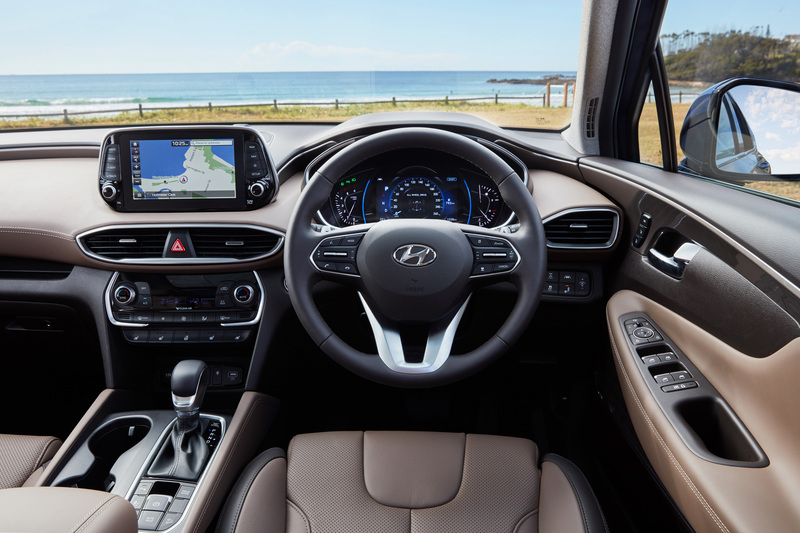 The 2019 Santa Fe model will also have an infotainment system which includes the Blue Link suite from Hyundai featuring its door locking, remote start, roadside assistance and car finder apps. It is compatible with Android Auto, and Apple CarPlay and the model will provide an optional Krell audio system too. 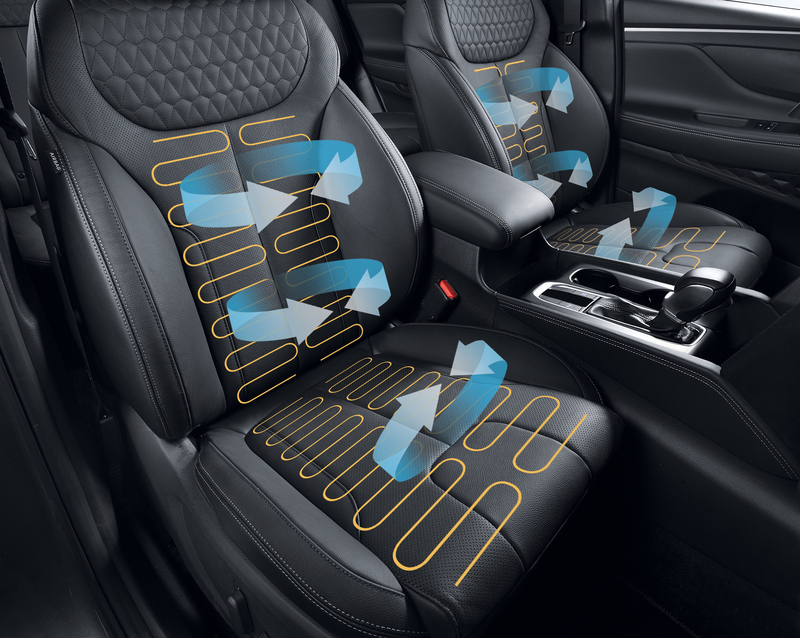 A cool feature that comes with this high-end option is the diamond texture speaker covers which will match the diamond quilt pattern of its front seats. Just like all of the compact crossover vehicles today, the new Hyundai’s seating position provides the driver with good all-around visibility. This is especially true when looking at the rear where its bigger glass and greenhouse area gives an improved view of the second and third-row passengers. Regarding the second row of the vehicle, a lot of leg room is available which is further improved by its ability to recline the backs of the fore and aft seats. This is a feature that will be crucial for the 3-row diesel models that will come out. For the front buckets, they are quite supportive and comfortable to sit on with all the controls and displays positioned to be oriented to the driver. Although the 2.0-litre turbo diesel is a bit less than what you’d expect, it can still provide a lot of twist which will make the new Santa Fe feel lighter on its feet when driven. Its steering has also been improved, and the ride is quite soft overall. The vehicle’s 8-speed automatic transmission gives it reliable and unobtrusive shifts while its other features such as the active cruise control and lane keep assist will work together well in both commuting and highway cruising. Meanwhile, the all-wheel-drive version of the new Hyundai comes equipped with the HTRAC system from the manufacturer which makes use of a variable-torque-split clutch with active torque control for its rear and front axles. Drivers will be able to choose from modes Normal, Sport and Smart when driving it. The Smart mode will choose on its own whether to go Normal or Sport depending on the wheel slip, throttle and other factors. With the Sport mode, there will be more torque given to the rear wheels which will make the Santa Fe feel a lot more dynamic. The new Hyundai Santa Fe will come with a set of Smart Sense active safety features together with other cool ones that we have not experienced before. One of the noteworthy ones is the rear-seat monitoring and reminder system which is able to sense movement within the vehicle after the driver has left it. During such circumstances, the system is going to honk its horn, flash its lights and send a message alert to the smartphone of the Santa Fe owner via Blue Link. This is a much-improved version compared to the similar system offered by General Motors. Another safety feature that is quite interesting is the Safe Exit Assist which will stop the driver from opening their door if the system detects a bike, motorcycle or car coming up behind the Santa Fe vehicle. This can help prevent a lot of accidents that can happen especially when you fail to pay attention to drivers that come up from behind you. Then there’s also the Blue Link telematics system of Hyundai which provides three free years of services which will have an emergency calling, automatic collision notification, car finder functionality, and alerts for teenage drivers that might go past the agreed speed limits, geographic boundaries and curfew times. 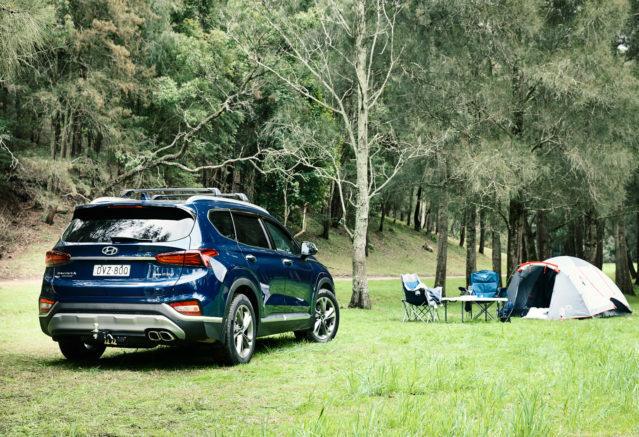 When it comes to its performance, the 2019 Santa Fe model carries over many of the engine specs of its predecessor. It will have three powertrains available, and the base engine will be a 2.4-litre 4-cylinder that can provide 185 horsepower. Those that want more for their trips can check out the turbocharged 2.0-litre 4-cylinder which can accommodate 232 horsepower. This new model will also offer a 2.2-litre turbo diesel 4-cylinder which can have 200 horsepower and an estimated torque of 320 lb-ft.
All of these engines match its new 8-speed automatic transmission which is made to give better fuel economy. 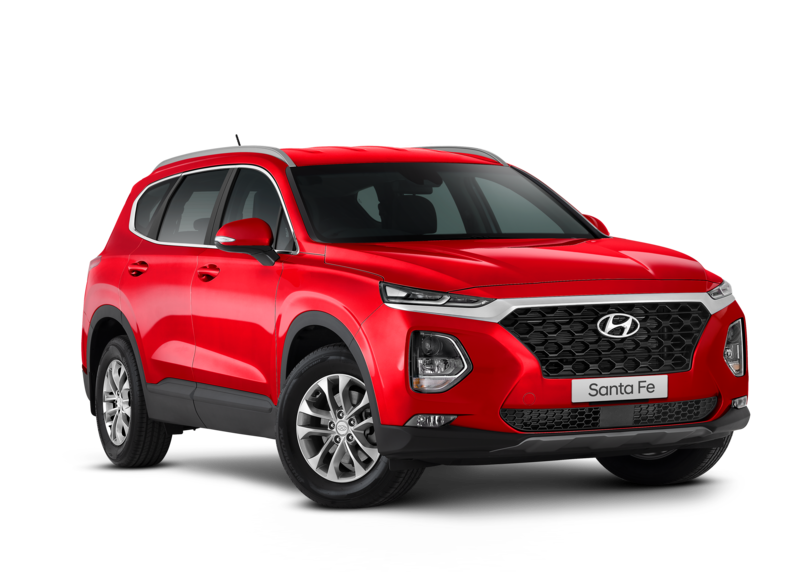 Apart from that, Hyundai also boasts that this new Santa Fe will have its ride and handling feel a lot better, which will also offer a self-levelling suspension to manage heavier payloads and to provide better towing. 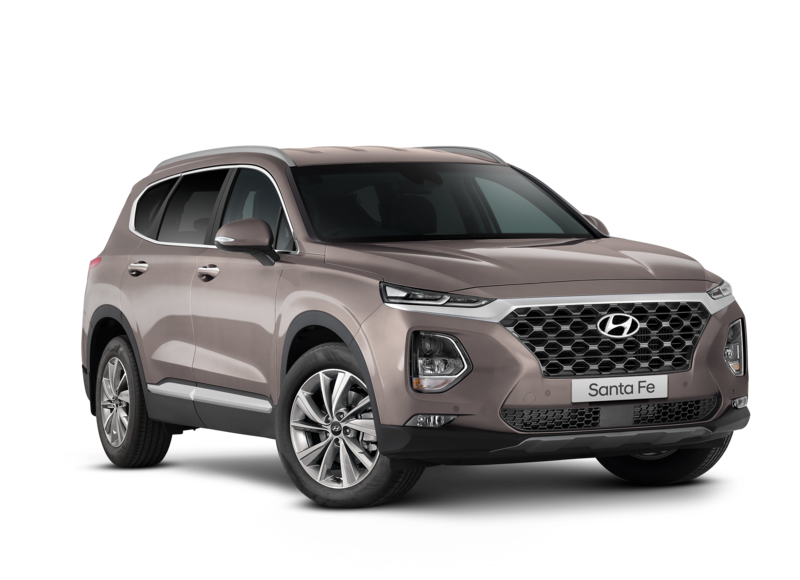 In comparison to the 2018 model, the new 2019 Santa Fe can be easily identified visually as this successor wears a new look from Hyundai. Drivers will note that it has a much more bolder look and a grille that is more upright and even accented by its chrome bar with LED slit lighting elements at the tips. The vehicle’s sides are a lot less slab-sided and more curvaceous, while its rear has a concave tailgate that comes with sharper LED tail lights that extend outwards. Many can say that this new model is more visually appealing compared to the Hyundai Santa Fe 2018. When looking at the interior of the two vehicles, they are easier to tell apart from the inside. Hyundai has really changed the cabin design of their 2019 model drastically. Its dashboard is much lowered, which will give the appearance and feel of a more airy cabin. It also has a touchscreen binnacle which comes up from it to give good sight to the many functions its infotainment provides. Generally, it looks more like a car than what we’ve been accustomed to standard SUV models. 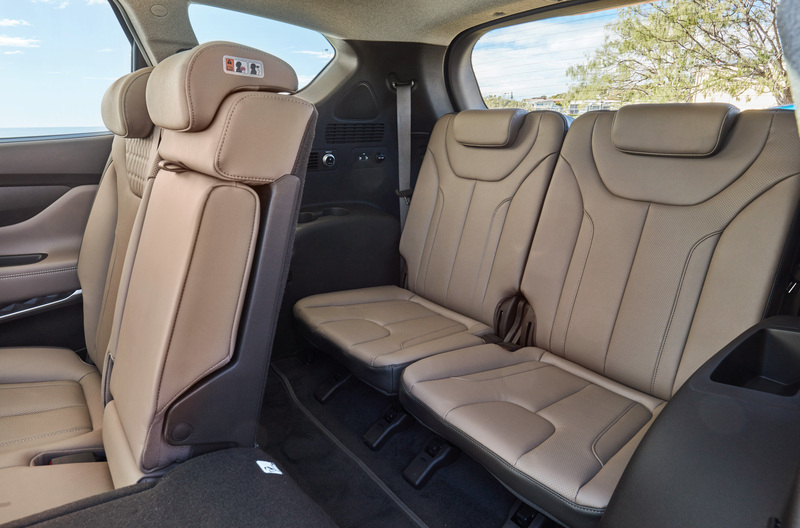 When it comes to the interior space, the 2019 Santa Fe has an additional 1.5 inches of legroom on the second-row compared to the Santa Fe Sport. This could make a huge difference between the knees of an adult touching the front seat or when fitting a child seat that is facing the rear easily. Although the 2019 Santa Fe provides a third-row seat, this lacks the dimensions that would make it compatible for adults. So when talking about the overall design, passenger space, performance and feature content, the 2019 Santa Fe model has multiple advantages over its 2018 predecessor. We can also suspect that it is going to be more efficient and provide a more responsive and superior driving experience. For those of you who are interested in giving the 2019 Santa Fe a test drive, then you have come to the right place. Aside from providing you with a Hyundai review for this upcoming model, we also provide test drives to let people feel just how it’s like to drive one of these newer vehicles today. Send us a message at John Hughes, and we’ll set you up so you can see for yourself how this new Santa Fe model will stack up with your choices.